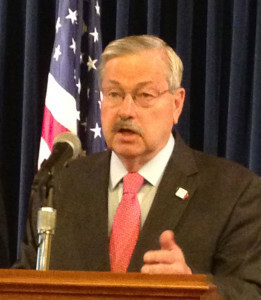 Governor Terry Branstad has asked the president to declare four counties federal disaster areas in the wake of the bird flu outbreak. The governor has asked that Buena Vista, Sioux, Webster and Wright counties be given the federal designation. His request says more counties could be added as the losses there from the bird flu are identified. More than 33 million birds may’ve been impacted by the deadly virus. The governor is requesting federal help for things like unemployment assistance, crisis counseling, disaster case management, and disaster legal services for those who have lost employment and income as a result of the bird flu outbreak. His request also asks for a waiver on tonnage limits on federal roads to help speed the removal of dead birds and the disposal process. Governor Branstad says in his letter to the president that more than 1,500 workers will likely lose their jobs as a result of the bird flu outbreak and says 438 people have already sought unemployment benefits from Buena Vista, Sioux, Webster and Wright counties. More are expected to lose their jobs by August.